ICE was granted a unique combination of civil and criminal authorities to better protect national security and public safety in answer to the tragic events on 9/11. Leveraging those authorities, ICE has become a powerful and sophisticated federal law enforcement agency. Hundreds of marches took place across the United States on Saturday as thousands of people demanded the Trump administration reunite families separated at the U.S.-Mexico border. The protests, marching under the banner "Families Belong Together," are hoping to push the Trump administration to reunite thousands of immigrant children separated from their families after crossing into the United States. Let’s be clear – the Demagogue in Chief high jacked ICE to push his poisonous agenda with over 2000 children separated from their immigrant parents. Rather than blaming Trump, some of the left has called for abolishing ICE. What to play into the Demagogue’s hands! "The Democrats are making a strong push to abolish ICE, one of the smartest, toughest and most spirited law enforcement groups of men and women that I have ever seen. I have watched ICE liberate towns from the grasp of MS-13 & clean out the toughest of situations. They are great!" Trump tweeted. In a follow-up tweet, Trump urged the men and women of ICE not to worry about the ongoing calls to abolish the department. "You are doing a fantastic job of keeping us safe by eradicating the worst criminal elements. So brave! The radical left Dems want you out. Next it will be all police. Zero chance, It will never happen!" he wrote. I know this Demagogue routinely lies but ICE was doing a fantastic job a few years ago. But even ICE has limited resources which this Demagogue has diverted from their true purpose. As such Trump is not only abusing the rights of these families, he is also making us less safe. I would hope the leaders of ICE would speak up and strongly object to what the Demagogue in Chief has done with their agency but to date they seem to be intimated from doing what is right. I would hope that Congress would hold hearings into this abuse of ICE and diversion of scarce resources away from securing our safety but these hearings are not going to happen as long as Mitch McConnell and Paul Ryan are in charge. But for God’s sake – could we on the left stop losing our minds over the rightful anger at the Demagogue in Chief so we can put forth a coherent message that taking back ICE not only ends the abuse of these immigrant families but gets this agency back to securing us as opposing as to serving the sick agenda of the Demagogue in Chief? Rumors are floating on the internet that NEC Chair Lawrence Kudlow is looking for new people to join the team advising President Trump on economics. Of course, the obvious place to start would be with him, a non-economist, although he has played one on TV a lot, who also has one of the worst documented forecasting records around, poo-pooing both the housing bubble and the early signs of the Great Recession a decade ago, along with forecasting a hyper-inflation out of Obama fiscal policy, although one must grant that he later admitted he was wrong on that one. He can also be credited with mocking Trump's proposed tariffs, until he was appointed to his current position, where he now says all this will lead to improved trade deals. We shall see. Anyway, it might be worth reviewing the current troops, probably the sorriest collection of economic advisers any president has ever assembled. Peter Navarro, an actual PhD economist out of Harvard, long at UC-Irvine, who now is chief adviser on trade. Some decades ago he wrote not-too bad articles and books on various topics, but has not had an academic article in over two decades, not that this is the end of the world. What is closer to that is that he has since written books not only calling for trade war with China, but even outright war. This is what caught Trump's eye, and, of course, he has advocated harder lines than Mnuchin in those reported screaming matches. I must note at this point my extreme annoyance that the media has completely dropped the ball on China openly bribing Trump with a half billion dollar payment to his organization in Jakarta three days before he announced that we must save jobs at certified national security threat Chinese company TZE. I see references to our deal with them, but the press simply never mentions this massive payment to Trump, surely the largest presidential bribe in history, if not to any US government official ever, although maybe in real terms some of those payments in the Grant and Harding admins were larger. But they were not to the presidents, and they all came from domestic bribers, not involving national security threats. Also on trade we have none-economist Wilbur Ross. He comes from the steel industry, enjoying the first round of protection from Trump tariffs. The we have non-economist Trade Representative, Attorney Robert Lighthizer. Now he does have some experience, having been Deputy Trade Rep in 1983-85 when Reagan had his round of trade protectionism, mostly directed at Japan. Lighthizer notes that when defending current policy, but his firm has also supported the steel industry in trade issues. He has become entrenched in his full hawk position since leaving the Reagan admin. We get a slightly brighter light if we look at powerless CEA Chair Kevin Hassett, another actual PhD economist formerly at the Heritage Foundation. People tell me that he is actually a nice guy personally, and mostly not just batshit insane or incompetent. OTOH, he was coauthor in 1999 with James Glassman of that insightful best selling book, _Dow,36000!_. Yes, still waiting on that one. One area where somehow Trump seems to have been more cautious is the Fed. Of course he should have reappointed Janet Yellen as Chair, but she had to go as an Obama person, not to mention a short woman. Jerome Powell is more central casting and a Republican. While not an actual economist, he is like Hassett not too unreasonable, "Janet Yellen lite," and indeed probably better than some of the gold bugs and general loonies that some GOP Congresspeople were pushing. Maybe that is his real estate background wanting someone who will not make interest rates go blooey all of a sudden. I close by noting that among those Kudlow is reportedly mumbling about bringing on board as something or other, the only name I recognized was Stephen Moore, who has been at Heritage at times, not sure he is now. Last I heard out of him his one suggestion of what needs to be done, and supposedly this is being seriously vetted by some on the current team as well as some in Congress, is more tax cuts for the rich. Really. Clearly at the top of our needs. Oh, I suppose one could also list non-economist Mick Mulvaney, currently running both the budget shop while taking apart the consumer protection agency. But then he is rumored to be possibly about to become Chief of Staff replacing John Kelly. Oh goody. What a crew. Immigration politics in both places has gotten very ugly, but it strikes me that in Europe it may be worse than in the US. We may be about to see the fall from power this weekend of Angela Merkel as Chancellor of Germany over the issue of immigration, with her having been for some time the leading political figure in Europe supporting more moderate policies towards immigrants, even as she has had to retreat more recently from her earlier opening to a million migrants from the war in Syria (and also some others in the region). If so, this will follow the coming to power of anti-immigrant Sebastian Kurz in neighboring Austria, who is actively working with Merkel's anti-immigrant critics to overthrow her, not to mention the strong reelection of Victor Orban in Hungary and the assertion of anti-immigrant policy in Italy with newly installed Interior Minister, Matteo Salvini. All this follows anti-immigrant forces coming to power in Poland and some smaller other nations, as well as the anti-immigrant Brexit vote in UK two years ago. Only in Spain have we seen the recent installation of a friendlier-to-migrants Socialist government in Spain, which is however preoccupied with the Catalonian separatism issue. Of course in the US we have seen Trump elected on a strong anti-immigrant wave, and he has just had a SCOTUS decision supporting his power to enact travel bans. OTOH, his recent awful policies towards asylum seekers on the Mexican border have led to a backlash that has forced him to back off somewhat, although what his actual policy there is currently somewhat unclear. He remains strongly anti-immigrant, but he did not win the popular vote, and he remains highly unpopular in the polls. His base clearly loves this stuff, but it does not seem to be selling with fervor or effect that it is in quite a few European nations recently. An important fact here is that in terms of surges of immigrants, whether legal or illegal, both places have had somewhat similar experiences. When Europe was facing the surge from Syria, the US was also facing a surge from Central America. While there has been a slight recent uptick in the US, the surge in Europe is over. Immigration rates have returned to the "normal" of before the Syrian war, but somehow the anti-immigrant fever seems if anything to be growing, with this further a bit of a mystery in that overall economic conditions are at least somewhat better as well than they were at the height of the immigrant surge. The only similarity to that in the US is that much of the anti-immigrant Trump base continues to believe that the US is being overrun by Mexican immigrants, whereas in fact net immigration of Mexicans has been essentially zero for the past decade. Those coming in now are from the troubled "Northern Triangle" of Guatemala, El Salvador, and Honduras mostly. So it would seem that with roughly comparable conditions in terms of immigration numbers as well as economic conditions (although the US is arguably somewhat better off on that than many of the European nations), the anti-immigrant fervor in Europe seems stronger politically than it is in the US now. Some of this may reflect broader anti-Trump sentiments in the US, with most of the anti-immigrant neo-authoritarians in Europe not as unpopular as he is (with some of them just freshly in power so not long enough to have engendered much hostility). But I suspect that beyond all that there is the more basic difference that indeed the US is fundamentally a land of immigrants, even if for some "nativist" Trump type WASPs, those immigrant ancestors came some time ago. But we have long had people coming in from many different places with varying degrees of success at assimilating them. This has not been the general history in Europe, where most nations have their identities strongly identified with a single dominant ethnic group with its language and usually religion as well. Small minority groups have long existed in most of these nations, and many have sub-regions with different groups dominant. But that is it, even in those sub-regions, there is usually a dominant group, and these groups simply have not had the experience Americans have had of more or less steady immigration and assimilation from a wide array of foreign nationals over a long time. The US is simply better at it, if far from ideal, given our history. And so, while strong anti-immigrant policies in places like Hungary may lead to strong reelections for those carrying them out, in the US the support for such policies is far weaker. During June 14-17 I was in Madison, Wisconsin for a conference and related carryings-on labeled as the title of this post. It was organized by local jazz musician, Ben Sidran and his wife Judy, close friends of Mayor Paul Soglin, who was first elected to the city council a half century ago and is now in his third round as mayor, his first starting in 1973. At age 74, I suspect this is his final term as mayor, and he is running for the Dem nomination for governor, hoping to be the "Bernie Sanders of Wisconsin," although with little chance to get the nomination. I think this conference is his last hurrah. It was initially inspired by the 50th anniversary of the October, 1967 Dow demonstration, which turned violent when the police started clubbing and tear gassing students. That led to massive student demonstrations. Soglin first emerged as a political leader in those demonstrations, so this was obviously a time for a retrospective. It covered a lot of ground, and in contrast to a similar conference back in 1989 when Soglin got back in as mayor for his second round, this one went beyond political and academic matters, with musical performances by people like Boz Scaggs, the Temptations, Tracy Neslon, and of course Sidran. There were also sessions on things like "Why We Get High" where researchers now studying the use of psilocybin as an anti-depressant drug spoke. Much of it was about politics though, with a lot of looking back to both the civil rights and anti-war movements of the 60s, especially in Madison. For old Madison political academic types, there were sessions on three of the famous history professors of rhe day: Harvey Goldberg, George Mosse, and William Appleman Williams. Among other things I learned that the charismatic and hyper-thin Goldberg once weighed 300 pounds before he got to Wisconsin. At one point on the Union Terrace I was hanging out with some participants and there was a conversation that really went back several decades where people got into a heated discussion about a bunch of political groups that do not even exist anymore. I mean, really, how important are all those splits between the various competing Trotskyist groups that used to go at each other so vigorously once upon a time? The organizers managed to get a lot of prominent outside speakers. A session on media had Jeff Greenfield and David Maraniss (originally from Madison). There was a good session on films that had Jim Abrahams who made movies with the Zuckers, although the Oscar winning documentarian Errol Morris failed to show. There were also some further alternative cultural activities, such as a Human Be-In on Picnic Point that commemorated the one on May 13, 1967 organized by Open Arts. A curious observation is that this group really looked old to me, and I am no spring chicken. I saw guys who were not only bald with white hair, but stooped over and doddering, a lot of that. Yeah, last hurrah for sure. But for all that this crowd was generally very sharp and and as intense as always, ready to rant on about this and brag about all their multitudinous past political activities. Only one who seemed a bit off was longtime anti-war leader, Evan Stark, who seemed not on top of it. Soglin himself seemed in good shape and looking younger than his age, however. Who knows, maybe he will hang on for another term as mayor. A major reason I went involved him and a matter I have posted on here previously, a matter of setting the historical record straight. This had to do with the bombing of Sterling Hall in 1970, about which there was not a session, although it came up in some, especially one about the campus newspaper, the Daily Cardinal, two of whose reporters participate in the bombing: David Fine and the still-missing Leo Burt (still no word on him, but plenty of rumors). I have previously noted that at the 1989 conference at a banquet, the lead bomber, Karl Armstrong, stood up and issued a full apology to everybody, including the anti-war movement. Soglin was there and was later quoted as making confusing remarks about what happened there. So, I had a conversation with him about the matter, and he now agrees with me about it. This was my main reason for attending, and I am satisfied with the outcome. I have recently returned from participating in a conference in Naples, Italy on "The Economy as a Complex Spatial System" where there many papers and much discussion about the longstanding poverty problem in southern Italy, long labeled "the Mezzogiorno problem." Mezzogiorno literally means midday or noon, but has long been applied to southern Italy because it is sunny, and middays are supposedly sunny. Unfortunately the problem is deeply entrenched and now tied to broader disturbing events in Italy and the European Union. The problem can be seen most acutely by considering Naples itself. Founded by Greeks in the 7th century BCE as "Neapolis" ("new city"), with modern residents being "Neapolitans," it was the second largest city in Europe (after Paris) in 1494 when Lorenzo di Medici ("the Magnificent," from Florence) walked alone to its gates offering himself as a hostage to make the first Italy-wide peace in centuries on the peninsula, seen by many as a distant prelude to the later unification of Italy, with Garibaldi conquering Naples sealing the deal. As late as 200 years ago, Naples was still the third largest city in Europe, with only London having joined Paris ahead of it. Today it is the third largest in Italy, with both Rome and Milan ahead of it, mired in corruption and dysfunction, if lots of faded glory from its eminent and influential past. More broadly throughout the Mezzogiorno, per capita income is 60% of the national average while the unemployment rate is twice the national average. This is not an equilibrium situation, with a steady outflow of migrants from south to north failing to bring about an equalization of wages or income. Many and long efforts have been made by national politicians to engage in educational and infrastructure investment in the region, but somehow it has all come to not much, with students coming out of the universities heading north for high paying jobs, and infrastructure falling apart as the Commora in Naples or Mafia in Sicily corrupt the construction industry with shoddy production amid massive bribe taking. It is not as bad as it was some years ago when I was there, but there are still piles of garbage in many places. Nevertheless, Naples is a charming and fascinating place. Furthermore, it is not that there have not been serious efforts to crack the corrupt local power structure. There was a huge effort in the 1990s that brought down the longstanding national political parties, as especially the long-ruling Christian Democrats had top politicians exposed as being in freemasonic (P2) conspiracies with longstanding Commora and Mafia figures in the South, with quite a few of them getting arrested, with several heroic prosecutors and judges dying in this noble effort. But despite all the shaking up and reshuffling long established patterns reasserted themselves, and not that much changed. The Mezzogiorno remained the same old problem. There is much debate about the ultimate sources of this, and most tend to invoke history and such matters as social capital, with Robert Putnam famously arguing that this latter is what is the key to understanding why northern Italy has done so much better than southern. Putnam blamed long rule by outsiders, especially the absolutist and autocratic Spaniards, for this, in comparison to the vigorous republics one found in the North such as Venice and Florence (with the Papal States in the center being their own thing). More than one paper at the conference ended up with some sort of social capital type explanation playing an important role. Now it seems that the ongoing problem of the South, exacerbated by a long economic stagnation of all of Italy, has led to a new political upheaval, with the latest election putting together two ideologically opposed parties to rule, although they agree on some matters, such as being pro-Russia and skeptical about the euro and the EU, if not ready to pull out of either. The previously ruling Democratic Party lost big and so did the center right party of Berluscoini, Forza Italia. The new rulers are the Five Star Movement, led by di Maiao, now Labor Secretary, and Matteo Salvini, Interior Secretary of the League, formerly the Northern League. The prime minister, Conte, is basically a figurehead, although he supported Trump at the G7 meeting on readmitting Russia. Supposedly 5 Star has the edge, but Salvini seems to be coming on strong, imitating strong man leaders elsewhere. League changed its identity last year, dumping its earlier incarnation as a neo-fascist separatist party based in the North and opposing sending aid to the Mezzogiorno. Rather he made it a national party and made an appeal to the South on the basis of an anti-immigrant platform. Southern Italy is where the most immigrants have been landing from Africa, and resentment has risen. The hard fact is that it was the South in the end that put the two parties over, voting especially strongly for the League. The Mezzogiorno problem has now become the Italy problem. Salvini has not only blocked immigrant boats from arriving, but he has also come out for rounding up the Roma (gypsies) and expelling them, as well as opposing vaccinations. I am afraid that di Maio is a cipher, and we shall in the not-too-distant future see this Salvini, riding on support from the long aggrieved Mezzogiorno, come to lead Italy. In my original post, I didn't say much about the overt racist expression in Gomper and the A. F. of L.'s advocacy for Chinese exclusion. I guess that is because I read the stuff voluminously a couple of decades ago and it by now it just seemed to me it was common knowledge. Of course it isn't. I was astonished and appalled when I first read it. Not so much at the vileness as at the obsessive repetition of that vileness. 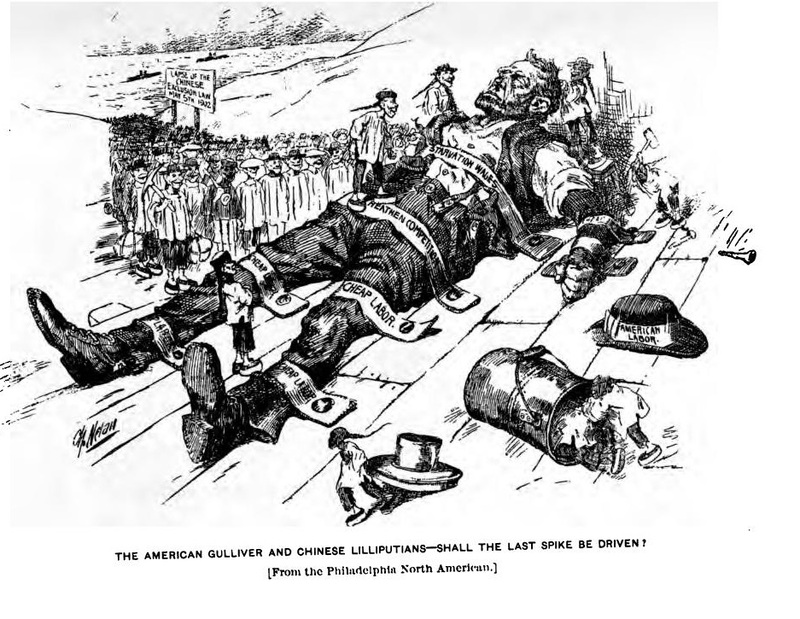 The pamphlet, Some Reasons for Chinese Exclusion gives a representative sampling. In the introduction, the authors assure the reader that they "are not inspired by a scintilla of prejudice of any kind..."
Stephen Miller, architect of the Trump administration's immigration policy is getting a lot of bad press these days. Some wags (and even relatives?) juxtapose Miller's photo to one of Nazi propagandist Joseph Goebbels, insinuating likeness of facial expression is a predictor of ideological leaning and propaganda technique. The comparison is as unhelpful as it is unfair. A more apt comparison would be with Samuel Gompers, founding president of the American Federation of Labor. 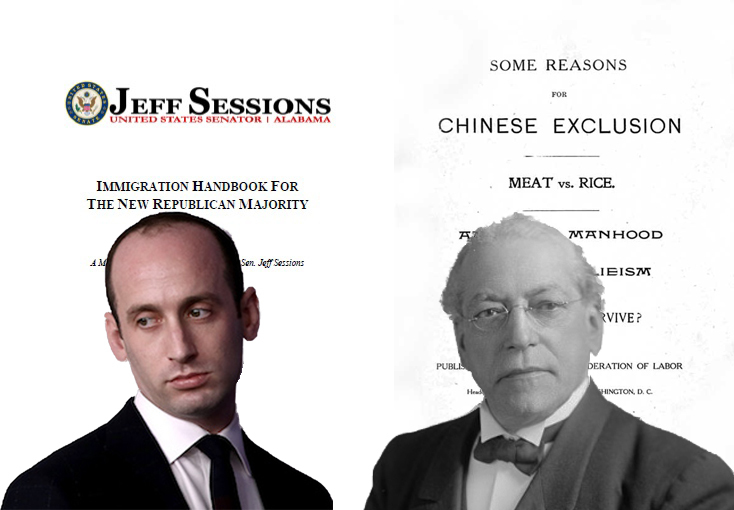 Miller doesn't look at all like Gompers but his rhetoric echoes Gompers's Chinese exclusion advocacy from the 1880s to the dawn of the twentieth century. It is only by discerning the similarities and differences between Miller's position and Gompers's that an effective rebuttal to Miller's policy prescriptions can be mounted. Miller's 2015 anti-immigration manifesto, Immigration Handbook for the New Republican Majority, is an articulate, compelling strategy polemic. It also discretely avoided any overt expression of racism or white supremacism. The handbook stresses polling that concluded "an economically focused message [on immigration] resonates with voters of all economic backgrounds and all ethnic backgrounds." More specifically, it cites the result that "86% of black voters and 71% of Hispanic voters said companies should raise wages and improve working conditions instead of increasing immigration." Simply put, we have more jobseekers than jobs. The principal economic dilemma of our time is the very large number of people who either are not working at all, or not earning a wage great enough to be financially independent. The surplus of available labor is compounded by the loss of manufacturing jobs due to global competition and reduced demand for workers due to automation. We have an obligation to those we lawfully admit not to admit such a large number that their own wages and job prospects are diminished. A sound immigration policy must serve the needs of those already living here. So whether comprehensive, piecemeal, step-by-step, incremental, or whatever other process one conceives, the question that must be asked is this: will the legislation make life easier or harder for American workers? Is there a single more reasonable proposition than to say that a nation’s immigration policy should consider first what is good for its own citizens? Republicans—who stood alone in Congress to save America from the President’s [Obama's] immigration bill and who alone have fought against his executive amnesty—must define themselves as the party of the American worker, the party of higher wages, and the one party that defends the American people from Democrats’ extreme agenda of open borders and economic stagnation. No issue more exposes the Democrats’ colossal hypocrisy than their support for an immigration agenda pushed by the world’s most powerful interest groups and businesses that clearly results in fewer jobs and lower wages for Americans. The American people are right to be concerned about their jobs and wages, and elected officials should put the needs of American workers first. The first goal of immigration policy needs to be getting unemployed Americans back to work—not importing more low-wage workers to replace them. Immigration policy needs to serve the interests of the nation as a whole, not a few billionaire CEOs and immigration activists lobbying for open borders. I especially like the part about Republicans defining themselves "as the party of the American worker, the party of higher wages." That is not to say they would have to be the party of workers and higher wages. But who could argue with that polling sentence about what the first goal of immigration policy needs to be? To reduce the persistently high unemployment rate in the United States, Congress should move to relax some of our current constraints on immigration. This is a controversial idea because many people are under the impression that allowing in more immigrants would push up unemployment. But that would only be the case if the number of jobs in the US were an unchanging constant. In fact, some categories of immigrants tend to create jobs, so letting them in would directly increase employment opportunities for people already in the United States. Whose argument sounds more compelling? Miller's or Johnson's? For me, it's a no-brainer. They are both right and they are both wrong. Allowing in more immigrants doesn't necessarily push up unemployment. Nor does it necessarily create more jobs for people already in the United States, a claim that Johnson deftly sidesteps actually making by referring to some categories of immigrants. Employment is not a "zero sum" game in which workers compete for some fixed number of jobs. Immigrant workers spend their wages in U.S. businesses—buying food, clothes, appliances, cars, etc. Businesses respond to the presence of these new workers and consumers by investing in new restaurants, stores, and production facilities. And immigrants themselves are 30 percent more likely than the native-born to start their own business. The end result is more jobs for more workers. The economic contributions of unauthorized immigrants in particular would be amplified were they given a way to earn legal status. Yes, employment is not a "zero sum." But no, labor supply does not "create its own demand." More importantly, however, simply repeating that platitude will not persuade underemployed or underpaid workers that immigration has made things better for them. The danger is that people who find Johnson's and Ewing's arguments unpersuasive will encounter no alternative to Miller's. That is where Samuel Gompers parallel comes in. This is not to say that his advocacy of Chinese exclusion was correct or justified. But it was subordinate to a positive program for fighting unemployment and raising wages. That proposal can be summarized in a phrase Gompers cited in 1887, "That so long as there is one man who seeks employment and cannot obtain it, the hours of labor are too long." Contrary to the claims of many mainstream economists, the job creating dynamic of shorter hours is not based on the assumption of "a fixed amount of work" that can be divided up in different ways to create fewer or more jobs. The shorter hours policy advocated by the American Federation of Labor in the 19th century was based on a dynamic theory of leisure, consumption and technological improvement that in many respects anticipated Keynes analysis more than fifty years later. Dorothy Douglas wrote about Ira Steward's Eight-Hour Theory in the 1930s and evaluated it positively. By contrast, Miller's immigration manifesto offers no positive program for job creation. It is simply supposed that the jobs currently occupied by immigrants would have existed anyway and would have been filled by American-born workers had there been less immigration. This is an unjustified supposition. It is conceivable that without the immigration that has occurred there would have been even less new employment created for American-born workers. The real danger of the Miller policy prescription is yet to come. Halting immigration will not create jobs. When the policy fails -- as it inevitably will -- it will become incumbent on the Republican administration to escalate the policy by driving out previously admitted, legal immigrants. A piece of work is Professor Walter E. Williams of George Mason University. Back in February, I flagged a column by Williams in which the nimble prof performed the lump-of-labor fallacy shuck and jive. One of the venues for that rendition of Will Automation Kill Our Jobs was David ("Trump is 100% right") Horowitz's FrontPage Mag. Little did I know at the time that just three weeks earlier, Williams had penned a defense of Trump's (Sessions's, Miller's) immigration policy, Immigration Lies and Hypocrisy also published at FrontPage Mag. One may admire the accuracy of article's heading as a label of its contents until one realizes it is not actually intended as a confession. I wrote to Professor Williams about the bizarre discrepancy between his January 30th column and his February 20th claims. I don't really expect to hear back. I appreciate that you "can't respond to every query" but my question raises urgent questions of morality and intellectual integrity. In February of this year, you wrote an opinion piece decrying the so-called "lump-of-labor fallacy" that you claim lurks behind concerns that automation will "kill jobs." I noticed that one outlet that carried your syndicated column was David Horowitz's "FrontPage Mag." The last four decades have witnessed the following: a period of record, uncontrolled immigration to the United States; a dramatic rise in the number of persons receiving welfare; and a steep erosion in middle class wages. But the only “immigration reforms” discussed in Washington are those pushed by interest groups who want to remove what few immigration controls are left in order to expand the record labor supply even further. How are any members of the Democrat caucus going to explain why they are determined to provide instant work permits to every illegal immigrant and visa overstay in the country? How are they going to explain why they want to double the number of guest workers when we don’t have enough jobs for the workers here right now? How are they going to explain why they voted for legislation that will surge the labor supply at a time when wages are down and a record number of Americans can’t find work? So, what does Walter E. Williams think of this Trumpian lump-of-labor fallacy policy? Judging from your column published in January of this year, people who disagree with that policy are liars and hypocrites. Your automation column was published about three weeks after your immigration column. How do you reconcile the discrepancy? 1. The first step, even before a carbon price or other measure is proposed, is for the government to announce a carbon budget, the total number of metric tonnes of carbon (equivalent) we intend to allow ourselves to emit between now and the end of the century. Without a benchmark we have no way to evaluate how stringent policy should be or whether it’s working. Also, it’s an initial act of global coordination, since it represents our “bid” for what we regard as our share of the world’s collective budget. 2. A system of auctioned permits is far preferable to one of taxes, provided it is comprehensive and allows for no loopholes, like offsets. It shifts uncertainty from emissions (which taxes don’t pin down) to prices, which makes sense since the cost to humanity from getting emissions wrong is much, much greater. It accommodates structural change in the economy better. And it gives us a better framework for the many years of revisiting and tweaking targets and policies that lie ahead: we should have political debates about whether to raise or lower the amount of emissions we allow, not the taxes we put on them. 4. I agree with Lott and Breaux that US leadership by example is the single biggest step we can take internationally, but we will need to do more if we want to address the legitimate concern of people in low income countries that overcoming poverty can’t take a back seat to curbing emissions. Both fairness and realism require the US to greatly increase its support for social protection and economic development in return for cooperation on carbon. A first step, which we could take unilaterally, would be to join the Leading Group on Innovative Financing for Development. Of course, we should be doing this even if there were no climate crisis that required it. 5. Once the economy faces dramatically higher prices for carbon energy, there will be a big demand for government programs to speed up alternatives: subsidies for renewables and energy efficiency, mass transit and infrastructure, research and development on frontier technologies. Here a coalition between left and right would probably break down. But that doesn’t mean we shouldn’t forge one to get to that point. I will spell out these ideas, and many others, in much greater detail in my book on climate change, which I hope will be out early next year. In the meantime, I’m happy to welcome support from conservatives who sense the urgency of preventing a climate catastrophe. I don't want to pretend that this explains everything. But it is "another brick in the wall," so to speak, if not the keystone. 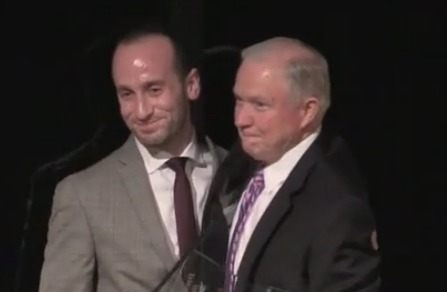 In January 2015, Senator Jeff Sessions produced an "Immigration Handbook for the New Republican Majority," written by his communications director, Stephen Miller. Miller's analysis in the handbook is just the sort of thing that economists would denounce as a "lump-of-labor fallacy." Curiously enough, few did. They were much too busy snatching pensions from future old folks on the pretext that older people working longer wouldn't "steal jobs" from youth. ...according to the BLS, all net employment gains since the recession have gone to foreign workers while 1.5 million fewer U.S.-born Americans hold jobs today than did then—despite the total population of U.S.-born adults increasing by 11 million over that same time. However, in a contest between suppositions based on peoples' perceptions and suppositions contrary to those perceptions, who do you suppose wins? As I have pointed out repeatedly, the "no zero-sum game" rebuttal, the lump-of-labor fallacy is a red herring. Sometimes there are empirically zero sums and there doesn't have to be a "fixed amount of work" for the actual amount of work to be deficient. As tendentious as Miller's and Sessions's argument may be, Walter Ewing's rejoinder is no less tendentious -- and loaded down with hollow promises and empty platitudes to boot. George Leighton, a crusading civil rights lawyer and later a judge, died earlier this month at the ripe age of 105. He was given an admiring obit in the New York Times. As stirring as it is, the recap of his life left out one of his longstanding passions: chess. Leighton was a fixture for many years in the Chicago chess scene. He was rated an “A” player—not a high flyer like a master or grandmaster, but strong enough to beat the majority of amateurs who play in occasional tournaments. I played him once in an open event. To be honest, the game was rather one-sided. Leighton defended the black side of a Stonewall formation, with black pawns on c6, d5, e6 and f5. He never got much going on the kingside, and meanwhile I infiltrated on the queenside, took over the center and won in a walk. I don’t have the score, but my memory is clear; the game was played back in my hippie days and I was a bit apprehensive playing a judge. But I also remember Leighton himself, his calm demeanor and respectful treatment of the scruffy kid, a fraction of his age, sitting across the board. And gravitas—I don’t think I’d every experienced gravitas like that before. I thought to myself, if I ever find myself in front of a judge, I hope it’s someone like him. This was almost 50 years ago. I can list only a handful of the hundreds of players I encountered back then, but George Leighton is on that list. It's not a crime if you brag about it on T.V. In fact, it's hardly worth mentioning. Does Greg Mankiw Know the History of U.S. Trade Policy? One of the major early actions of Congress was the passage of the Tariff Act of 1789, which was designed to: raise revenues for the new government by placing a tariff on the importation of foreign goods (averaging more than 8 percent); encourage domestic production in such industries as glass and pottery by taxing the importation of those products from foreign sources. Someone at Harvard’s history department should visit Mankiw’s office. From this perspective, the most important point about labor regulation in a developing country is that it should not exacerbate imbalance, increasing the gap between the formal and informal sectors and loading more weight on clientelist mechanisms. The best forms of regulation are either universal or written to apply at least as strongly at the bottom of the labor market as at the top. I’ve written a bit about how that can be done in the realm of health and safety, and there’s no reason it can’t also guide policy in wage regulation, union rights and all other aspects of labor policy. For instance, take minimum wages. By definition, these apply only in the formal sector, and if the effect of raising them is to intensify the formal-informal gap, that can be a problem. But there’s a way to avoid this: for every increase in the minimum wage, pair it with an increase in income transfers or similar social protection measures for those outside minimum wage coverage. Hold the gap constant or reduce it. It’s not impossible once you know what you’re aiming at. My personal experience is that, once you’ve trained your eyes to see clientelism, you notice it everywhere. It’s not confined to low income countries or economic goods. It isn’t necessarily harmful, although, when it metastasises and displaces other social and economic arrangements, it can be deadly. I suspect it is the main factor in differences in x-efficiency, and if true, this makes it one of the main determinants of the wealth of nations. I find it incredible that organizations like the World Bank could dispense reams of development advice without considering how its proposals will pan out in a clientelist world. Not really a surprise, after all, it is Monday, and RJS has been at this for quite a long time at his post at WaPo. But the recent release of the Trustees' Report has not only gotten the Associated Press all bent out and shrieking "insolvency," but I think with the push coming from the recent massive tax cuts that are swelling the budget deficit, the usual old gang of "cut the entitlements!" VSPs are out in force and raging pretty hard. So Samuelson is denouncing "The Cowardice of the political class," just unwilling to cut those benefits like they should, darn them, and calling for us "to rewrite the contract between the generations," even thought about the only new thing in the report is that indeed Medicare is looking more financially troubled, and it has always been in much bigger trouble than Social Security. But it and Medicaid involve medical care, and we know that is a political nightmare, so time to go after those Social Security benefits in the name of helping out those young people by cutting their future SS benefits now, because otherwise they might get cut later. Dean Baker has an excellent post on this today (I am never abler to link to him for some reason) at Beat the Press, and makes lots of valid and excellent points about how totally misguided RJS is, which I shall not repeat here. I shall simply pound the point in more with some further observations. One is that while RJS starts out going on about the Trustees report as if it is telling us something new, it really has no new news about Social Security. While he hyperventilates quite dramatically, late in the column he admits that "The trustees' reports don't help us much, because they focus on the minutiae of various trust funds rather than fundamental questions about the proper role of government" (which should not be to help old people so darned much!). Darn. The "us" here, of course is all these ranting VSP ninnies who keep crying out that the sky is falling so the benefits must be cut, but the report simply does not say anything of the sort or particularly support such a push. Also near the end, RJS does admit that "Yes, taxes have to go up..." but that is it on the tax issue, with not a whisper about the massive tax cut we just had. No, undoing that nonsense is not the priority, it is cutting those darned benefits now! Maybe we could have cut the benefits more gradually if we had started way back when the VSPs started all their whining about this, but no, now only drastic action will forestall SS recipients in 2034 receiving real benefits equal to what they do now (no, RJS has never heard of the Rosser equation, poor thing). As it is, he does admit that the art of all this that is rising the fastest is the medical care part, but he does not even nod at doing anything about that, because cuts in Medicare or Medicaid get borne by doctors and hospitals. Of course, Dean has long pointed out that patents on drugs and the forbidding of doctors to immigrate are major contributors to the outlandish medical care costs we face in the US, but RJS has nothing to say on this. That out doctors get paid twice what those in other high income nations do? Not a problem, instead to insure their high incomes we need to cut Social Security benefits, and the sooner the better! Finally, of course, these hysterical ninnies never compare what is going on in the US with what goes on in other high income nations. Of course the medical cost situation is simply an outrage, with us far above them for much poorer health outcomes, but that cannot be touched. But even on Social Security, US demographics, including the retirement ager he wants to see further raised, look good compared to other high income nations. Many of them pay more than we do, have their people retire younger, have longer life expectancies (RJS is very upset that people are living longer in the US, oh no! ), lower birth rates, and lower immigration rates (or used to), but somehow these other nations have managed to pay their old people what they promised them, and with most of their economies not exactly falling totally apart. Again, after the baby boomers finally get fully retired by the mid-2030s or so, the increase in SS payments will only amount to about 1% of the US GDP, not exactly an overwhelming amount, although RJS like others prefers to throw around scary raw numbers rather than a percentage that shows what the order of magnitude of what is involved here really is: not that big of a deal, and certainly not worth all his moaning and wailing and gnashing of teeth. Yes, the US political class is cowardly, but not because it is afraid to go after Social Security. I do not think I have to list the many ways they are cowardly that are far worse. The lump-of-labor fallacy CLAIM is the wage-fund doctrine in disguise. The fallacy claim's conclusions about the ultimate futility of workers' demands are indistinguishable from the doctrine's conclusions.. Only the premise from which those conclusions are deduced has been altered. Instead of asserting a certain quantity of work to be done, the fallacy claim attributes that fixed assumption to a designated scapegoat: workers, unions, populists. The claimants' own assumptions are left undefined, as an amorphous "in reality." That undefined "reality" is a given amount of capital for employing workers that can only be increased or decreased as a result, respectively, of a decrease or increase in the cost of labor. That is to say, a wage-fund lump! The wage-fund doctrine was debunked in 1826 by Sir Edward West. It was "recanted" in 1869 by John Stuart Mill. The lump-of-labor fallacy CLAIM was shown to rely on the discredited fixed wage-fund assumption by Charles Beardsley in 1893. So why do economists (& CEOs) still cling to this dogma? Because it conceals real economic relations, on the one hand, and justifies them, on the other. Because it disarms working-class movements and rallies public opinion behind bourgeois resistance to the demands of working people for a better life. Because it is the principal ideological weapon in the arsenal of capital in its disputes with labor over the the hours of work. Dean Baker at Beat-the-Press has pointed out (sorry, not able to link to it) that Associated Press put out a tweet that presents an essentially hysterical story about future prospects for Social Security following the recent release of the Trustees. This report says that as of 2026 Medicare and as of 2034 Social Security will face a "shortfall." However, the AP tweeted that what they face is "insolvency." Needless to say, "insolvency" is much more serious than "shortfall" and simply feeds the overblown hysteria that so many think about these programs, feeding political pressures to mess with them. The new report provides the latest update on what would happen if the forecast happens and nothing is done. Given that the projection is that Social Security benefits are set to increase by about 20% by 2034, if somehow nothing were done and benefits were set to be reduced so that they could be paid by expected tax revenues, the benefit would be cut back by about that amount to about what they are now in real terms. In short, this is not the hysterical crisis AP suggested or that so many think is out there. We have seen this nonsense before. of course, Dean accurately points out that by law the benefits must be paid. This may also be a time to remind everybody that the US is really in much better shape demographically in terms of life expectancies, retirement ages, and expected population growth rates than most other high income nations, with such cases as Japan and Germany in much worse shape than the US. However, all these nations are making their public old age pension payments. In the case of Germany the payments are higher than in the US, but the payments are being made, and its economy is humming along very well. There simply is not basis for any of this hysteria in the US regarding the future of Social Security.